Twin siblings Rosa and Cy Franco use their decorating talents and ferocious bargain hunting skills to help their Dollars and Sense Design customers make caviar dreams come true on bologna and cheese budgets. When the business hits the skids, they stumble upon the chance to compete in decorating contest. The location is The Pelican Inn, a charming seaside getaway that has seen better days, owned by the intrepid Bitsy. With a small budget and a few weeks at their disposal, they aim to win the contest prize, a feature story in Great Escapes Magazine. If they lose, the teetering Pelican Inn will likely go on the market and their designer dreams will fall apart. Bitsy’s gorgeous nephew Pike enters the picture, dredging up memories from her disastrous teen years when Rosa struggled to balance life with an alcoholic mother and a distant father. Returning to the tiny seaside town where she was raised by stand-in mother, Bitsy, Rosa is plunged into an adventure that will rearrange her past and future and restore her heart along the way. I haven’t read a Harlequin romance since high school but if Ms. Mentink’s style is any indication, I’ve been missing out. I thoroughly enjoyed this book. 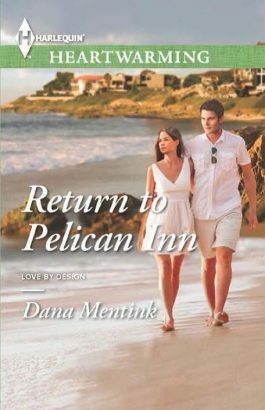 Rosa and her brother Cy return to Pelican Inn as contestants in a decorator’s contest. They have hopes of reviving their flagging interior design business and also of helping their elderly adopted aunt. No sooner does Rosa arrive than former high school boyfriend – a romance that went terribly wrong – Pike – now a successful, handsome lawyer – slides off the roof right at her feet. The sparks are set to fly.